At last, a superhero movie starring a woman! Again. I've mentioned before that I'm not a fan of politics in movies, including gender politics. I liked 1992's Buffy the Vampire Slayer despite its imperfections; I didn't like 1984's Supergirl despite loving the character. Still, you have to consider that the actual first female superhero movie, Supergirl, was a box office bomb. Could it be male fans just couldn't handle it back then? Maybe. Just the same, my criteria for a great movie includes only: Do I love it? That's it. 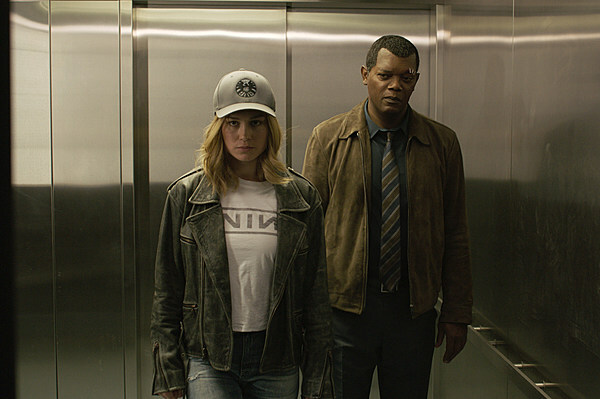 From that standpoint, Captain Marvel is a great movie. Yes, if you're looking for female empowerment it's there in spades, but mostly in a below the surface iceberg kind of way that doesn't interfere with the fun. 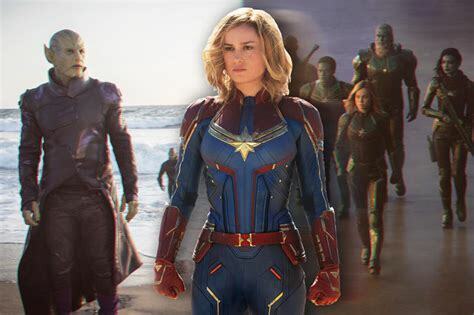 Brie Larson plays Vers, who's fighting on the side of an alien race called the Kree against the aggressive, awful, and certainly evil looking Skrulls. When a mission goes badly Vers finds herself stranded on the backward planet C-53, otherwise known as Earth in the 90s. There, while trying to hunt down the Skrulls, Vers stumbles across a young SHIELD bureaucrat named Nick Fury. They're working undercover; Fury even took his eye patch off. 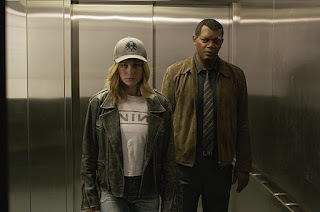 From here on, Captain Marvel is at its best as a buddy comedy/adventure, with Vers and Fury working together to identify the Skrulls, who can shape-shifting into anyone. There are twists--one of them huge--and callouts to the comics and other movies along the way, while the amnesiac Vers also begins to uncover facts about her previous life. There was some concern about Larson's ability to play Captain Marvel (she never goes by that name in the film), due largely to her youth, especially when we find out she's been a warrior for many years. It's baseless: Larson does a fine job, even holding her own against Samuel L. Jackson's Nick Fury. Jackson gets de-aged thanks to movie magic, which makes me wonder if I shouldn't get into acting now that I can be thirty again. See, you know the Skrulls are the bad guys, 'cause they're ugly, and green, and have pointed ears. Like Vulcans. The other actors also do a fine job, including Jude Law as the leader of the Kree battle force, Annette Bening as Dr. Wendy Lawson, and Lashana Lynch as a former fighter pilot--the latter two figure into Vers' past. It was great seeing Clark Gregg again as Agent Coulson, this time as a green young agent in a sadly small part. Then there's the cat. Don't miss the cat. Captain Marvel has the usual great special effects and action sequences, and it's fun to look back to 1995 and see what's changed since then. Although for me the opening sequences labored to grab my attention, the movie more than made up for it as it went along. Entertainment value: 4 out of 4 M&Ms. I enjoyed it even more than most Marvel movies, and that's going some. You can't beat a superhero movie that takes its world seriously while applying a nice layer of humor. Oscar Potential: 2 out of 2 M&Ms. 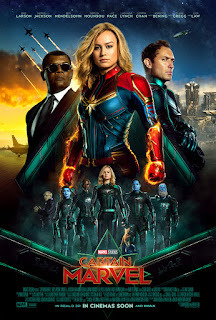 There's nothing wrong with Captain Marvel from a quality standpoint, but it's a superhero movie. You're not likely to see much Oscar attention for those now that Black Panther's done. Unless they do a Black Panther/Captain Marvel crossover, of course.